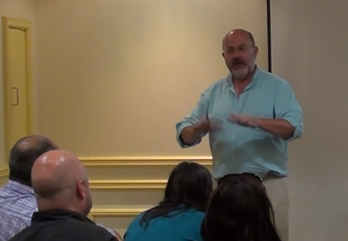 This is a video of a personal appearance by John Sweeney. In it, he describes his experience with the Church of Scientology to a small audience. John Sweeney is a British investigative reporter. In a distinguished career, he has toured war zones, filmed secretly in North Korea, confronted Vladimir Putin – and more. Only once (to his intense embarrassment) has he lost his temper on camera. Significantly, this happened when he was making a programme about Scientology during which the Church subjected him to an intense programme of surveillance and provocation – “Scientology and Me” which appeared in 2007. Some time later, Mike Rinder a top spokesman for the Church who had been involved in ‘handling’ Sweeney, became disaffected and left the organisation. He has since become a prominent critic, and featured in a follow-up programme also by Sweeney “The Secrets of Scientology” (2010). In this, we learned more about the campaign that had been mounted against the BBC crew three years previously. Sweeney has also written a book “The Church of Fear” which goes into Scientology, and the background to his two programmes about the Church, in great detail. You can watch John Sweeney’s presentation in a video window after the break. This is Sweeney in relaxed, informal and iconoclastic mode – but still deadly serious on the subject of Scientology. It gives another perspective (and a great insight) into what it is like to investigate Scientology, and into the Church itself. We learn a lot about the making of his programmes – and why he lost his temper in 2007. The parent site, http://www.flagdown.org exists, but it supported an anti-scientology conference which took place in May 2014 and is now lying fallow. If I prrefix http://www. to your link, I enter that site, and get a ‘page not found’ error page. While I appreciate your interest, I hate dead links – can you please look into this? Thank you very much for posting this video. I’m really enjoying it. Sweeney is an excellent investigative journalist with a great – very British – sense of humour. The work he’s done to shine a light on the cult of Scientology is invaluable.